We certainly agree with the notion that art opens up a world of possibilities for youth to think abstractly and foster their own creativity. The Culture, Education, Sport and Ethics Program (CESEP) is one which we are honored to promote among young people around the world. This program incorporates the benefits of art and creativity into the process of learning about sport. This international outreach program engages young people on another level. Teachers, parents, coaches, and other adults are able to follow a guide as they teach youth about important values in sport, such as remaining drug-free, good sportsmanship, and fair play. Then the children and teens are challenged to illustrate what they’ve learned. This process encourages the youth to consider what they’ve learned in an abstract way, while also activating different parts of their brain. We believe the process of both teaching the sport values and ethics while also encouraging the youth to express them creatively leaves a lasting impression. The artwork we see each year of CESEP never ceases to amaze us. As the program began to grow, we decided to begin compiling these pieces of youth art into books to better share these amazing pieces all over the world. Now we publish a new book each Olympiad. For the 2014 Winter Olympics edition, we collaborated with Art of the Olympians to create a book which includes both youth art and the art of former Olympians. We often hear the word “doping” during the Olympic Games or as new sport season begin. However, it is not always clear what is meant by the one-word designation for cheating in sport. We’ve outlined the basic performance-enhancing drugs and methods used by some athletes. Blood Boosters are drugs which increase your blood’s oxygen-carrying capacity – above its natural capacity. Erythropoietin (EPO), which Lance Armstrong has admitted to using, is a blood booster. EPO is a naturally-occurring hormone which makes the production of red blood cells possible. Athletes can inject the hormone into their system, enabling their body to create more red blood cells. Diuretics help eliminate fluid from the body. Athletes who need to be maintain a certain weight level for competition could use these to decrease their weight. Because they also dilute urine, which decreases the likelihood of detecting the presence of other drugs, diuretics can also be used as masking agents. Lean Mass Builders amplify the growth of the body’s muscle. This category includes several different classes of drugs, particularly the more popularly known anabolic steroids and human growth hormone (hGH). HGH is a polypeptide hormone with the primary function of cell reproduction and regeneration, which has an obvious benefit for athletes. Testing for this drug was not possible until the early 2000s, when blood tests were finally able to distinguish between naturally- and artificially-occurring hGH. Masking Drugs, like diuretics, serve the purpose of hiding evidence of other prohibitive substances or methods. A popular method for doing this is injecting the natural steroid Epitestosterone into your system after using steroids to increase your testosterone. Because the methods which raise testosterone do not naturally also elevate Epitestosterone, athletes will increase their Epitestosterone levels so that, when tested, the ratio between testosterone and Epitestosterone is normal (it should be 1:1). For example, Floyd Landis, after winning the Tour de France, was tested. His T/E ration was 11:1; the limit is 4:1. Painkillers enable athletes to push through pain to train or compete. Typically narcotics are banned substances. Sedatives are used when an athlete desires to reduce their nervousness, or when they may need to be more steady. Stimulants increase activity in the central and peripheral nervous systems. As a result, athletes who use them can experience enhanced focus, aggression, and energy. Gene Doping allows athletes to alter their bodies in such a way that various proteins and hormones in their bodies operate differently. For example, exogenously introduced hormones (added by injection) can actually be naturally produced (endogenously) in their body. Or Myostatin, a protein which inhibits muscle growth, can be mutated to limit its effectiveness, which would result in increased muscle production. Blood doping refers to the practice of utilizing blood transfusions to supply an athlete’s body with an increase in red blood cells prior to competing. Increased red blood cell presence allows for more oxygen to reach the lungs and other muscles, increasing aerobic capability. Homologous transfusions use compatible blood types from a donor, while autologous transfusions are done with the recipient’s own blood. The blood is harvested some time prior to competing, frozen and stored. This process does not effect the red blood cells. Then, shortly before competition, the transfusion takes place, increasing the red blood cell count in the athlete. For an updated list on the prohibited substances, established by the World Anti-Doping Agency, click here. As a foundation we have the opportunity to seek out and discover organizations across the world that are enhancing the lives of youth. By supporting these organizations with grants, we are able to increase our impact tenfold. While many of our grant recipients provide programs for both young men and women, in honor of Women’s History Month, we’d like to highlight Girls Inc. of New York City. Girls Inc. of New York City offers a variety of programs and opportunities to under-served girls ages 6-18 from all of New York City. The programs boast research-based curricula and touch on all aspects of young women’s lives — media literacy, financial understanding, sexual health, athletics and physical health, safety, education, and more. By collaborating with other community organizations, Girls Inc. is able to serve over 2,500 young women from New York City each year. They maintain a presence in 22 neighborhoods with over 30 sites. The New York City organization is an affiliate of the national Girls Inc. organization. Together, with hundreds of other affiliates, Girls Inc. of New York City inspires girls to be STRONG, SMART, and BOLD. Friendly PEERsuasion® – Here young woman learn to resist the pressure from peers to use illegal or harmful substances, such as drugs and alcohol. Preventing Adolescent Pregnancy – By building self-esteem and teaching skills and information about sexual health, Girls Inc. empowers young women to make healthy choices regarding their sexuality and reproductive well-being. Operation SMART® – This community-based program encourages girls to develop skills in the fields of mathematics, science, technology, and engineering. Media Literacy – Everyday young women are exposed to hundreds of messages from mass media. This program challenges young women to think critically about what these messages are telling them. Leadership and Community Action – This program is designed for girls to celebrate their heritage while also building leadership skills and working to create lasting social change. Sporting Chance® – With this program, girls are offered the chance to try new athletic endeavors they may otherwise never have attempted. Girl athletes may not always feel like they have support from their school, parents, or community. However, many organizations offer resources for girl athletes, whether it’s research , scholarship opportunities, health information, etc. these groups are familiar with the unique challenges women face in sport. We’ve compiled a list of some of these agencies and organizations below. 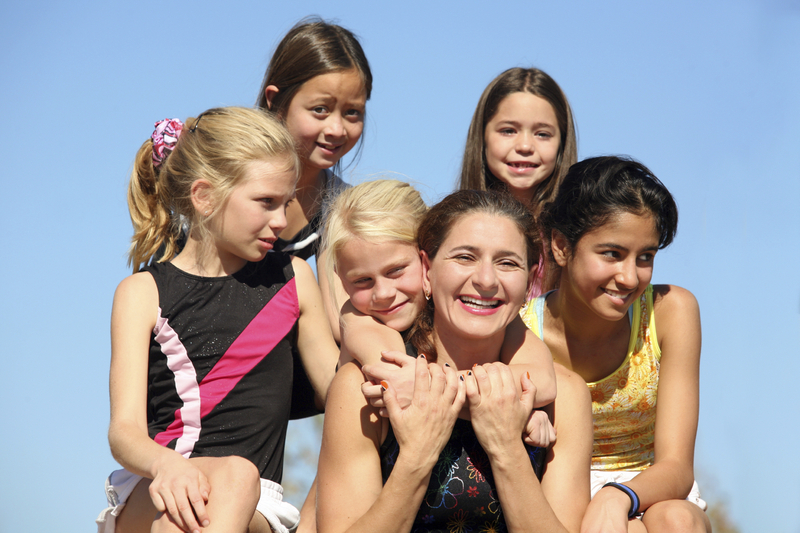 The Female Athlete Triad is and should be a concern for coaches and sports parents — as well as for young women who play sports. The triad is a grouping of three interrelated health conditions sometimes found in female athletes. They are Menstrual Disturbances/Amenorrhea, Bone loss/Osteoperosis, and Energy Deficiency with our without disordered eating, “underfueling.” A survey of eighty high school athletes found that 78% of the respondents had one or more of these conditions. Given this high number and how the three conditions interact, the Female Athlete Triad is certainly something to be further examined. Disordered eating is often the cause of “underfueling.” In efforts to achieve or maintain a lower weight, women who diet run the risk of not consuming enough calories and nutrients to allow the body to run properly. On the other end, a deficiency can occur when an athlete overexercises and depletes their body’s energy storage too quickly or too frequently. The American College of Sports Medicine emphasizes the importance of resolving the issue of energy deficiency, as this component is the cornerstone of the Female Athlete Triad. Both menstrual disruption and bone loss are results of under fueling. Aside from the significant health risks imposed by under fueling, young athletes are liable to reduce their ability to succeed on the field and in the classroom. Under fueling negatively impacts cognitive functions, can cause depression, and disallows the body from performing at its peak potential. As previously mentioned, energy deficiency can disrupt many bodily functions, including the productivity of various hormones. Some of the hormones directly affected by poor diet or overexercise regulate a woman’s fertility systems, such as GnRH (gonadotropin-rleasing hormone), LH (leteinising hormone), FSH (follicle stimulating hormone), prolactin, and progesterone. As a result, menstrual disturbances or a complete absence of menstruation (amenorrhea) may occur. This change in a young woman’s body is often the first obvious indicator that the Female Athlete Triad may be affecting her in other ways as well, which should promptly be investigated. Some research studies have indicated that it is the low body fat percentage which leads to amenorrhea, but emerging research suggests low body fat is simply a correlation — not a causation — of missed periods. As such, low body fat percentages should be taken as indicator that something more is happening. The dangers of overlooking this body signal could potentially lead to later issues in fertility and child bearing, but no research studies have produced somewhat mixed results on this. Ultimately, this leads to a great concern, that is the loss of bone density. The third and final component of the Female Athlete Triad is bone loss, or osteoporosis. Estrogen is a hormone produced in the ovaries and plays an important part in ovulation and menstruation. However, it is also key in the body’s ability to absorb calcium in the intestines. The less estrogen a body produces, the more difficulty it has absorbing calcium, which is essential in maintaining bone health. Estrogen also plays a much more complex role in bone health. To understand its role, we must first understand the process of bone formation and bone remodeling. Osteoblasts are bone cells which promote born formation. Osteoclasts are bone cells which break down bone and release minerals, in turn also transferring calcium into the blood stream, a process also known as bone resorption. These two types of bone cells work in tandem and delicate balance to create new bone and constantly remodel current bone cells. Estrogen moderates the functionality of both osteoblasts and osteoclasts. With osteoclasts (the cells that break down bones), estrogen inhibits their activity — keeping the bone resorption in check. Osteoblasts, the born-forming cells, are encouraged by the presence of estrogen. So when estrogen is NOT present or only has a minimal presence, an imbalance of bone creation, bone remodeling, and bone resorption occurs. The bones lose their density and become less able to support the skeletal structure and repair themselves after injury. Some studies have suggested that bone density loss as a result of amenorrhea can sometimes be irreversible, even with calcium supplements. While it is important to note that any woman (athlete or not) is vulnerable to energy deficiency and the subsequent amenorrhea and bone loss, female athletes are at a greater risk due to pressures related to sports. Young women who participate in sports which require lean body mass, require weigh-ins to compete, or encourage a certain body shape are particularly susceptible to the disordered eating which can result in energy deficiency. Other external influences on these athletes could controlling parents and/or coaches, pressure to win “at all costs,” social isolation, consequences for gaining weight, etc. On top of these risk factors, it is alarming how many female athletes are told it is “normal” to have an absent menstruation cycle. Mobilize available resources – nutritionists, athletic trainers, counselors, and physicians. Consult a sport nutritionist to help you design an appropriate diet that is specific to your sport and to your body’s energy needs. Seek emotional support from parents, coaches and teammates. The Female Athlete Triad represents a complex array of psychological and physiological issues which will need to be addressed. A team of support should be created, which can include: coaches, parents, athlete, mental health counselors, primary physicians, nutrition specialists, and, if necessary, medical specialists for bone loss and hormone therapy. Through the guidance of this team the athlete should strive to restore a healthy energy balance by maintaining a proper diet — this is often where much of the mental health counseling should focus. After consulting with a physician, the athlete can also begin strength and weight-bearing training, which can improve bone health. Sports and athletics can greatly enhance a young woman’s well-being. This is where some parties take issue with the idea of the Female Athlete Triad. The concern is that some female athletes will shy away from sports, or that their parents’ concern of this danger will prohibit them from trying athletics. This is where education and awareness are key elements in fully understanding what the triad consists of and how it progresses. Along a similar vein, many supporters of female athletics feel that by implying these trio of health conditions is unique to females, it pathologizes being female. It is important to note that both men and non-athletes can also find themselves susceptible to the triad.